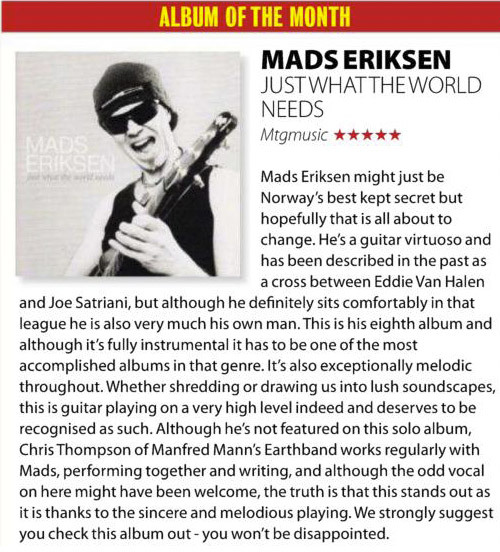 Review of "Just What The World Needs"
Chris Thompson har siden han forlot Manfred Mann's Earth Band for tre årsiden, turnert med supergitaristen Mads Eriksen fra Bergen. 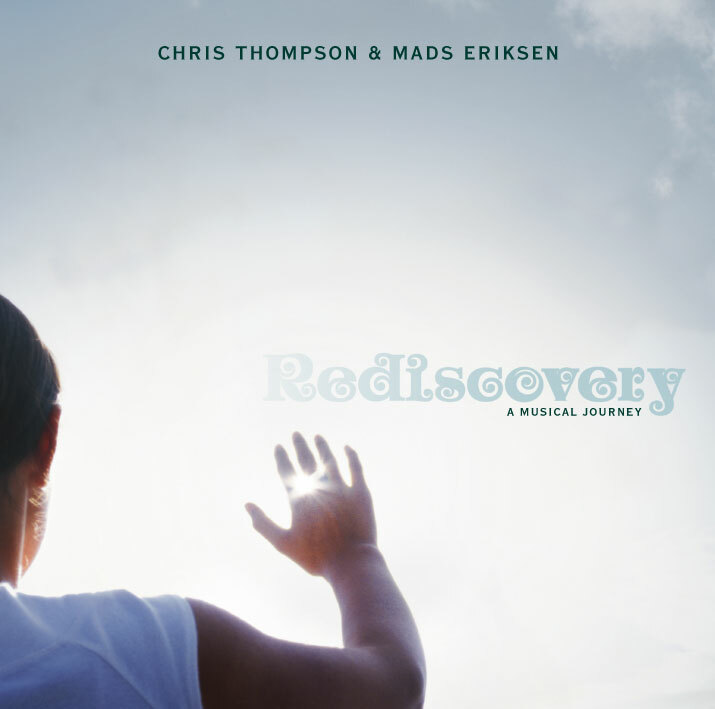 "Rediscovery - A Musical Journey" er deres første album sammen - et konseptalbum om ei ung maorijente fra Thompsons hjemland New Zealand. Av gudene får hun magiske toner som blir sendt til folk i hele verden, som dermed blir hypnotisert og påmint hva som er viktig i livet. Blant de 26 kuttene fordelt på 72 minutter er det flere korte instrumentaler ved Eriksen (blant annet surfrock, metal og blues), maorisang, rapping og høytlesning. Det hele er en musikalsk reise som kan minne om Pink Floyd, symforock og Roger Waters' album "Amused To Death". Men egentlig er "Rediscovery - A Musical Journey" ei popplate med flere gode melodier, kompet av norske studiomusikere. Unntaket er "Radio Waves", der hele Manfred Mann's Earth Band spiller. Chris Thompson synger som vanlig glimrende, og blant høydepunktene er "Dust In The Light (Divorce)", folkrockvalsen "God's Own Country" og "You're The Voice". Sistnevnte var en stor hit for John Farnham i 1989, men det var Thompson som skrev den. Alt i alt spriker albumet og konseptet kan være vanskelig å svelge for noen, men det er mye bra musikk her. English translation (pdf) of the interview with Mads in Bergensbladet - thanks to Trude Lines! "Chris Thompson og Mats Eriksen Band komplementerte kvarandre perfekt, og Haavebua var somme tider i fyr og flamme då klassikarar vart henta fram på konserten fredag. Manfred Mann's Earth Band klassikarane "Davy's On The Road Again", "Blinded By The Light", "Mighty Quinn", og Bob Marley sin "Redemption Song" var alle på plass til ellevill jubel frå publikum. Men det skal seiast at Thompson sine nye låtar som han opna konserten med, så absolutt kunne stått på eigne bein. Allsongen til dei gamle sviskene ljoma under tjærebreidde buabjelkar, og fleire gonger vart Thompson overraska over eit publikum som kunne tekstane. Thompson viste også kvifor han er ein vokalist dei store stjernene ønskjer i studio på platene sine. Rett og slett den beste rockevokalisten underteikna har høyrt i Florø. Mats Eriksen er rekna for å vere ein av dei raskaste gitaristane i verda. Bergensaren med fleecejakke, joggesko caps og kort gitarreim, minner lite om Steve Vai, Yngvie Malmsteen, Joe Satriani og dei andre i gitargud-kategorien. At han er stor, viste han då han laga bakoversveis på luftgitaristane i lokalet med å trakterte gripebrettet med fingrane som styrtregn som treff eit blekktak. Han let det vere med den sekvensen, og det var nok for å stadfeste verdsnivå. Moro for oss her på berget er at Florø-gitaristen Jørn-Lasse Førde Refsnes tidlegare har vikariert for gitarfenomenet frå Bergen. Sjølv om Chris Thompson flyt på fortida med Mannfred Mann's Earth Band, var han absolutt vital ved sidan av Mats Eriksen og band som gjorde denne fredagskvelden i Florø minneverdig." "Beautiful English soul with tremendous Bergen backbone"
"Those of you who believe that the former Manfred Mann’s Earth Band singer Chris Thompson had his highlights in the seventies and only happens to visit Bergen because the ferry to Denmark docks here, really have to revise their opinion. With a Bergen backbone, existing of a bunch of local veterans, Thompson has found his way to a remarkable collaboration. The tour start in Bergen Thursday night showed itself to be a direct hit. Perfectly balanced between new and old tunes: some Thompson tunes, some from Eriksen  plus a lovely bunch of roses from the golden era of the MMEB. Even if the musicians in the band has left their early youth, it is far from some tallow faces we are dealing with. These guys conjure up a monumental thrust in the tunes, something that really shines through in their spitting sanguine adduction of one of Thompson’s new tunes, ?Get Up and Dance?. After loading it out in buckets for a while, an acoustic, down to earth version of ?Redemption Song? is a fine change to the electric bucketloads coming from the stage. And Bob Marley’s hymn to liberation suddenly starts the crowds singing. ?There’s an angel watching over me? Thompson sings in ?Angel?. Exactly if this is true I don’t know, but I’m damned sure that higher powers are looking after his voice. Even at a mature age Chris Thompson has an outstandingly good rock’n’roll voice  and an even more fabulous voice control. Impressive! These guys are enjoying themselves  and this is noticeable. And when they add a solid bandfeeling, it could hardly be more fun to see them live. Stifflegged and tight faced Mads Eriksen is no great audience flirt, but when he tears off the fattest, meanest and most coarse guitar riff’s he’s still an experience. Perfect to the fingertips of course, no wrong notes coming from that guitar. Former Stage Dolls-drummer Steinar Krokstad is pushing delightfully from behind, Frank Hovland is sporting a huge grin back there grooving and doing small dance steps over his five string bass. And when Gunnar Bjelland trudges in motion the intro for ?Quinn the Eskimo? on a real B3 organ, the crowd sounds like the soccercrowds at Bergen Stadium when Brann has beaten Rosenborg 5-0. It’s Christmas Eve at Den Stundesløse; the band hammers out the old MMEB classic in a remarkable heavy version, where Mads Eriksen even plays Eddie Van Halen in the interlude. Great fun! Quick and elegantly the band slides into Eriksen’s own ?Burning Light?, a ponderous and grand ballad, before you’re at it again: ?Blinded by the light?. Complete jubilation and a thousand hands swinging in the air, the poor waiters are being shuffled around, Gunnar Bjelland delivers the most delicious organfill, Kim Fairchild sings against the massive crowds lead by Thompson, this old Springsteen tune seemingly never ends - and thank God for that. This is pure delight! Thanks to the glowing effort produced by the band, and thanks to all the vocal soul, power and beauty Chris Thompson manages to produce. As the first encore Thompson and Bjelland does a bare, airy ?For You? that would have made any live record bubbling with pride. Add a brilliant ?The Voice?, that Thompson wrote and John Farnham had a huge international hit with, and the good old ?Questions?, and you will presumably realise that you have missed a great happening. Don’t make that mistake again". "This is an album that not only shows the versatility in the artistry of Mads Eriksen, it may also be his most commercial to date. This is helped by the fact that Chris Thompson joins in on 4 of the tracks". "Even with stellar performances and amazing technical skills, "Suburban Cowboy" is not just about guitarplaying ability. Eriksen's songwriting is essential to the success of this album. His excellent sense of tonality and ability to set moods are the elements that bring this CD together". "Somebody get this guy a green card! Talk about unknown guitar heroes, Mads Eriksen is Norway's secret weapon, a guitarist who has compiled a mature, tuneful, venturesome, multi-faceted second album of instrumental rock. Storyteller impresses via Eriksen's up-front, busy but never showboating fretwork, and also through the versatility of his playing, the deluxe, richly textured multiple guitar arrangements, and the rythmic and melodic maturity of his writing. His playing is controlled but aggressive, swaggering but cohesive, one that also draws parallels to Eddie van Halen, Joe Satriani, Steve Morse and, in jest on "The Night a Stranger Came to Jam", Yngwie Malmsteen. 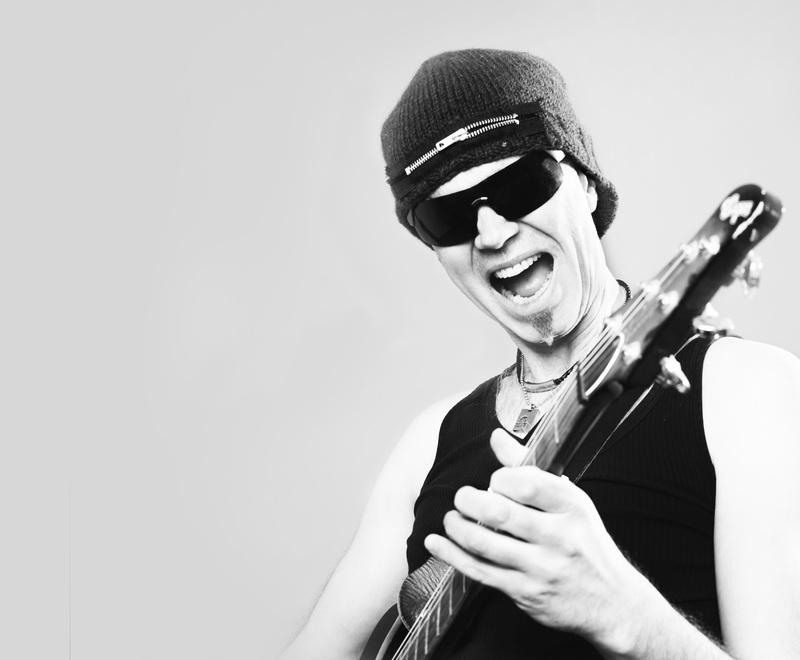 He fires off involving licks in the best juicy metal style, while just as easily shifting into expressive melodic leads or high-tech dulcet country picking. Even when he approaches the cliched, on "Slammin'", he never fails to make things happen. 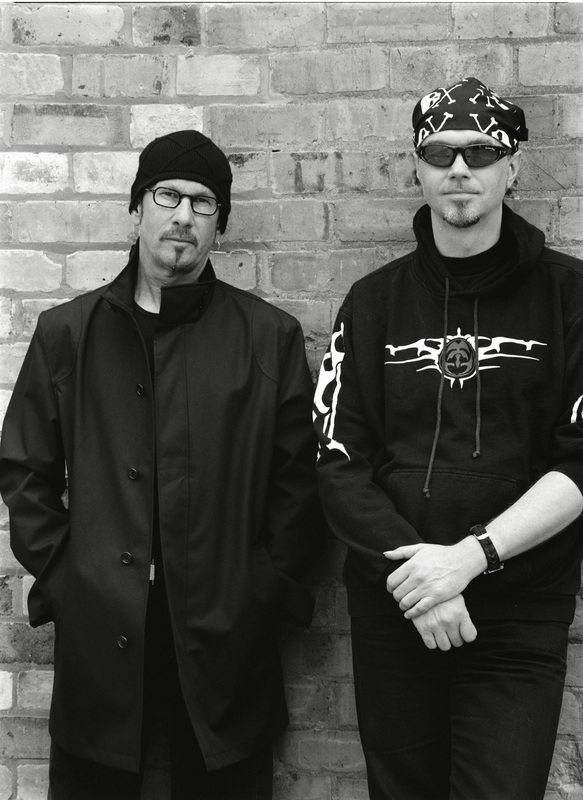 Storyteller is infused with a self-deprecation humor, including a send-up of rock's musical excess on "Western Trash", as well as an affecting Russian folk suite". "...reveals a wealth of versatility, highlighted by widestreched arpeggios, one-handed hammer-ons and pull-offs and a great vibrato-bar technique. 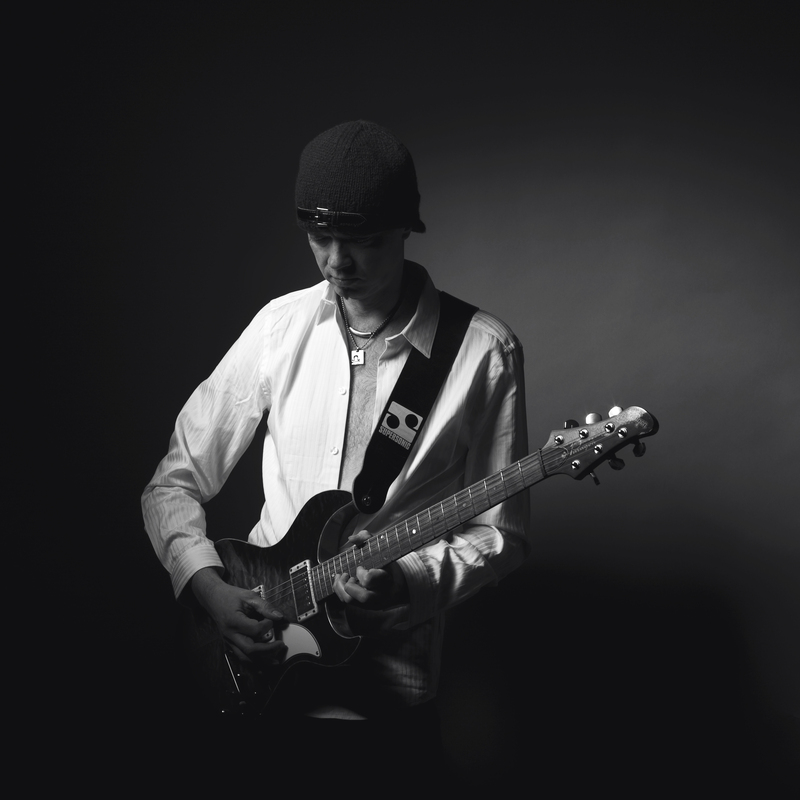 Sounding at time like a cross between Joe Satriani and Eddie van Halen...". "...some of the heariest, off-of-your-seat tones laid to tape since Randy Rhoads' crucial early 80's pyrotechnics with Ozzy Osborne".